Flaxseed, or linseed, may have originated in Egypt. The seeds, oil, and seed meal can be used in many ways. Flaxseeds contain phytoestrogens which may reduce your risk of breast cancer and possibly prevent a recurrence. Flaxseeds have two anticancer components: lignans and an omega-3 fat called alphalinolenic acid" (ALA). You may be familiar with flaxseeds as they are used as a natural laxative, a good source of dietary fiber, and in preparations that help lower your cholesterol. Flaxseeds may also be helpful in reducing your risk of heart disease, osteoporosis, breast cancer, and endometrial cancers. Flaxseed oil has been used for the relief of hot flashes, breast pain, arthritis pain, and pain related to constipation. Several studies have been done to determine how the phytoestrogens in flaxseeds may help cancer. One theory compares the estrogen-receptor blocking ability of flaxseeds with estrogen-receptor modulation drugs. The weak plant-based estrogens block the estrogen receptors on cells within breast tissue, starving them of full-strength female estrogen. This possibly stops tumor growth and prevents cell damage. This effect may be most effective for younger, premenopausal women with estrogen-receptor negative cancers. A clinical trial combining flaxseeds with a macrobiotic diet has been done by the National Center for Complementary and Alternative Medicine. Among other goals, the study hopes to find out whether a macrobiotic diet that includes flaxseed will be beneficial during and after breast cancer therapy. Dietary Fiber: Freshly ground flaxseeds are a good source of dietary fiber. You can sprinkle these on breads, cereals, soups, and salads to lower your cholesterol and your risk of heart disease while keeping your tummy happy. Fiber from flaxseeds helps reduce constipation, but must be used with plenty of fluids. Add flaxseed oil to salad dressings or mix it with a smoothie. Lignans: Flaxseeds and sesame seeds are both great sources of lignans, a plant-based estrogen. Lignans may act as weak estrogens, fitting in to estrogen receptors on cells in breast and endometrial tissues. This action may protect cells that may become damaged or become cancerous when in contact with powerful female estrogens. Alphalinolenic acid (ALA): An omega-3 fatty acid, alphalinolenic acid is not made in your body but must come from food. Omega-3 fatty acids are polyunsaturated fats that help reduce inflammation. When omega-3s are part of a well-balanced diet—which includes vitamin C, vitamin E beta-carotene, and selenium—they may be most effective in preventing and even treating breast cancer. 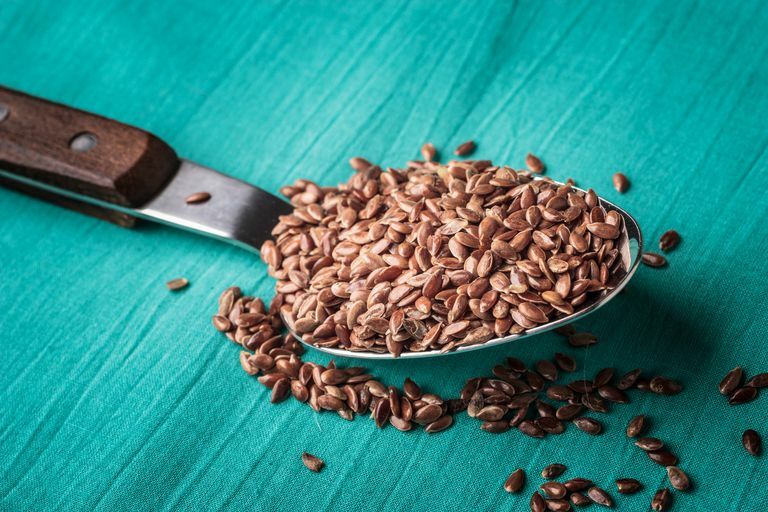 If you're taking flaxseed as a laxative, drink plenty of water to avoid constipation or intestinal blockage, as the seeds expand during digestion. Your body needs time to absorb the components of flaxseed, so wait a while before taking any other supplements or medications. Avoid flaxseed oil if you are allergic to flax or if you are pregnant or nursing. If you've had estrogen-receptor positive breast cancer, use flaxseed products in moderation. National Center for Complementary and Alternative Medicine. National Institutes of Health. Herbs at a Glance. Flaxseed and Flaxseed Oil. Last modified: October 22, 2008. National Center for Complementary and Alternative Medicine. Clinical Trials. Macrobiotic Diet and Flax Seed: Effects on Estrogens, Phytoestrogens, & Fibrinolytic Factors. Completed in August 17, 2006. Does Eating Fruit Fight Breast Cancer? Does Soy Prevent Breast Cancer or Make It Grow? Can Estrogen Cause Lung Cancer to Grow Faster?